Long before my husband got deployed, when we knew this deployment was possibly on the horizon, I found myself saying, “I couldn’t handle a new baby with the two kids we have if you get deployed.” You ever hear that line, “If you want to hear God laugh tell him your plans?” Yeah, I found myself staring at a positive pregnancy test just a few weeks after I said that. And then, Baby O came barreling into this world just four days before my husband left for deployment. This was 12 whole days before his due date. His birth date was an answered prayer. I was just certain he’d be born the day after my husband left. All of my babies are blessings. Each one has been wanted and loved. And, I’ve been blessed. We live across the street from my parents. My mom often brings us dinner, my dad takes care of our chickens and dogs. My Nana and Papa come over every week and help me catch up on the laundry. I’m not in this alone like a lot of military wives. That said, our world changed when my husband left. He was my rock. The guy who would help me clean the kitchen. The Daddy who would give the kids their baths and put them snugly into their own beds at night. The fun Dad who would wrestle and play “Beast” with his son and dance with his daughter in the living room. The loving husband who would bring me a glass of water and my vitamins before bed. He’s my best friend. I cooked dinner for us all to sit around the table together and eat. We would go to the zoo and Chick-Fil-a together. Overnight his reassuring hugs and his kisses were just gone. In his place I was left with this little bitty baby who needed me for everything and two other children who didn’t really understand what had just happened. It’s been months since he left. My kids are doing well, but obviously nothing is the same. There are lots of hard times when the baby is crying, my daughter is crying, and my son wants a cup of milk and I feel like everyone is screaming at me to DO SOMETHING and I’m screaming on the inside and thinking I should run away. Of course, I never would. I pray. I read books like Desperate, and God Strong, and Hope for the Weary Mom. I daydream about the day our family is back together and I don’t have to only talk to my husband through a computer screen or an iPhone. You know what it really comes down to, though? Things are hard, things are tough, but there’s really only one thing I can actually do. I pick myself up. I get out of bed for the third time in the middle of the night when my daughter wants a drink. I get out of bed at 6 a.m. when the baby won’t nurse back to sleep. I pick up that pile of toys for the fifth time during the day. I read books to my babies and do crafts with them despite the mess they make. I laugh and play and giggle and push them on the swing even when I’d sometimes rather go inside and watch a movie. There is no other choice. I have three little people who depend on me. I’m not perfect. I have my moments when I lash out and act snappy and impatient. There are moments when the clutter and the chaos want to bring me to my knees. But I do the best I can to be the best mother I can be. This is what God called me to be. Long before I ever met my husband and we created these babies together. Thank you for writing this. While our situation is not as tough as yours, my husband works a lot and cannot help at home for the time being. We don’t have any family around and I often find myself in the same place as you do. 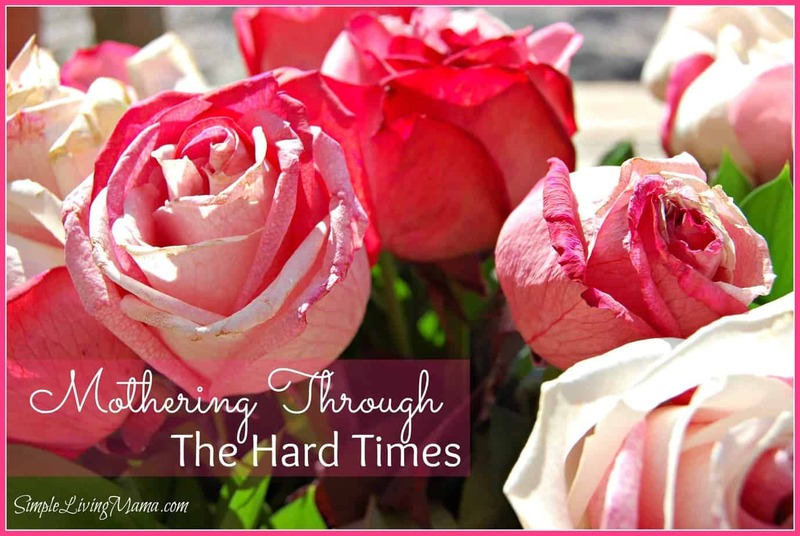 Reading about other moms going through the same thing really helps. Hi Val! Thanks so much for your comment. We are all in this together! I feel like this sometimes, and I have just one child! You are my hero. Thanks for sharing this, it was beautiful to read. Thank you so much, Jen, for your sweet comment! You are exactly right. We keep going through the hard stuff for our little people! God Bless!